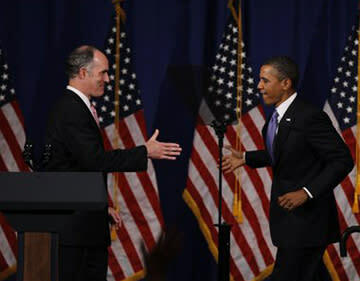 Reince Priebus, the chairman of the Republican National Committee, offered a $100 reward on Wednesday to anyone who snaps a photo today of Bob Casey, the Democratic senator from Pennsylvania, with President Obama during his visit to the state. "I've got $100 dollars... for any person that can get us a picture here," Priebus told reporters on a conference call. Priebus said that in an effort to distance himself from the president and his low approval ratings, Casey may suddenly come down with a "24 hour flu." Rob Gleason, the chairman of the Republican Party of Pennsylvania, said on the call that he would be "shocked" if Casey fails to make an appearance. "That would be a slap in the face to the president," Gleason said, because it would suggest a "lack of confidence in the president's ability to get elected." As of Wednesday morning, Casey's campaign had not publicly released the senator's plans. It remained unclear whether he would appear with the president during Obama's appearance in Scranton. Casey is up for re-election next year in a state where the president has dismal approval ratings. A Public Policy Polling survey released last week showed the president with a 42 percent approval rating and a 53 percent disapproval rating in Pennsylvania. Polls show that for now-- in the absence of a clear Republican challenger-- Casey maintains a lead over the major potential Republican candidates for his seat. He is more popular than the president among Pennsylvania voters. Pennsylvania and its electoral votes will play a key role in the 2012 presidential election. Gleason, although opposed to the president and his policies, said Wednesday that Obama's visits are positive in that they signal his home state's prominence in national politics. "I love that he comes here ... and I hope he continues to come," Gleason said of the president. Obama is scheduled to meet with a Scranton-area family at their home Wednesday afternoon and deliver remarks at Scranton High School.